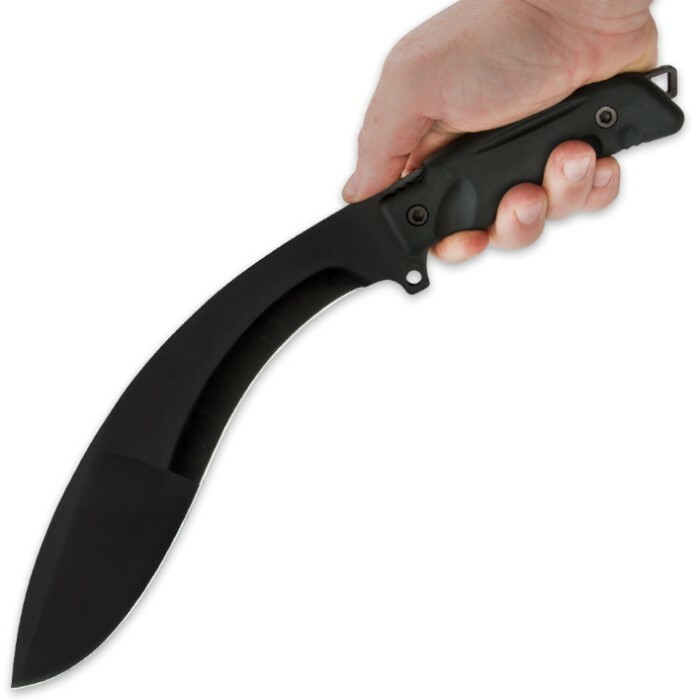 Extreme Duty Full Tang Kukri Knife With Leg Sheath | BUDK.com - Knives & Swords At The Lowest Prices! With ¼"-thick steel construction, this high-performance blade is ready to take on every tough job you can line up for it. The 10-1/2" blade has a sharp edge with a pronounced curve, and the full-tang construction allows for heavy-duty use. The impact-resistant rubberized handle scales provide a secure, slip-free grip. The exposed tang on the end allows you to attach a lanyard for an on-the-go kukri that won't stray far. 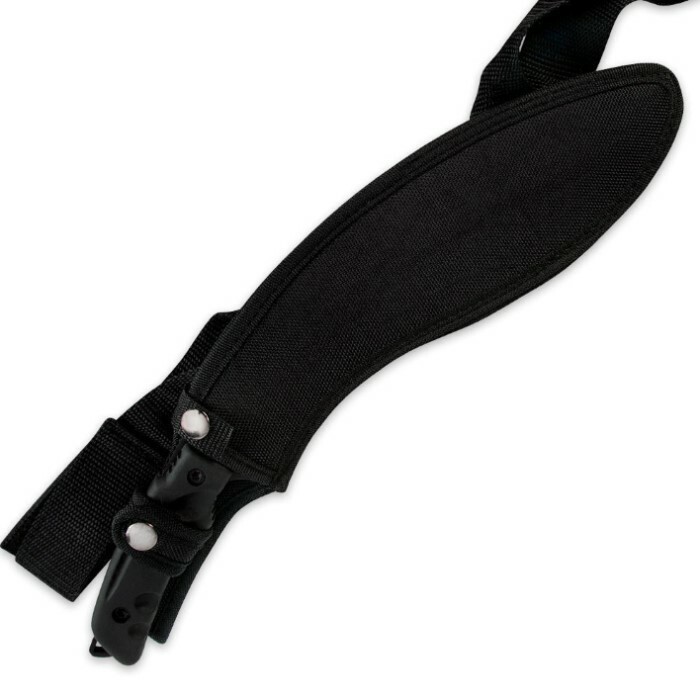 A heavy-duty nylon leg sheath allows you to carry this blade like military and law enforcement professionals. I have purchased from True Swords a few times and like the company. I ordered this years ago and kept it in my survival bag, but I never tried it out. Big mistake. I tried using is last year when I went on vacation to the Great Smoky Mountains National Park. I tried chopping up a small down tree, the tree wasn't too hard. The blade not only dented and chipped but actually split in half. It seemed as though this knife was made of 2 pieces of metal fused together because it split along the blade. To clarify: it didn't break in half, the knife actually split in two right up the blade. This knife feels great in the hand, has awesome weight, but is not functional at all. I just received this knife and couldn't be more pleased with it. 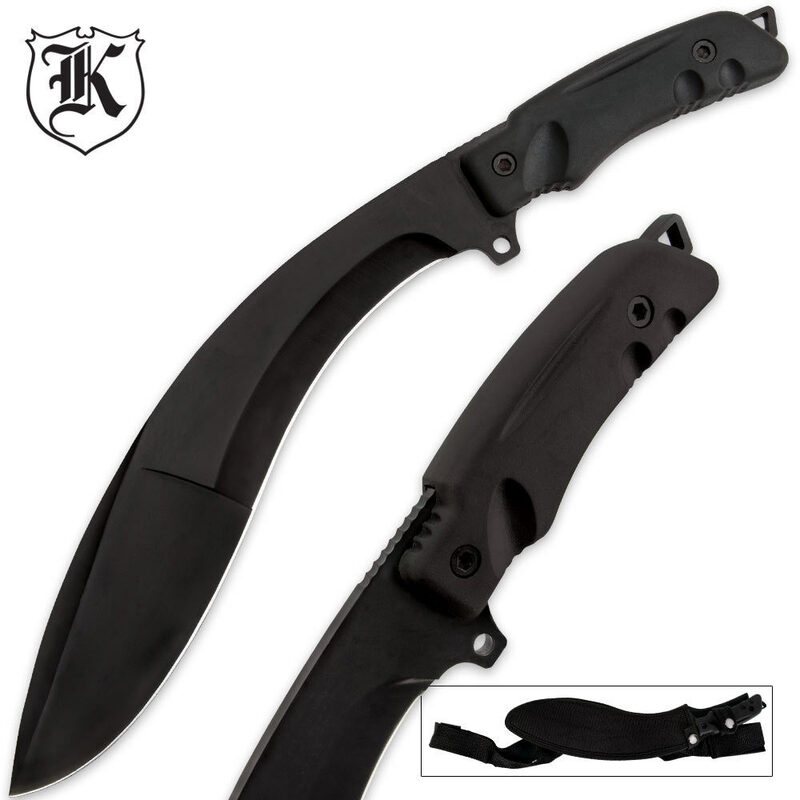 It's exactly what I was looking for in a heavy duty kukri. The handle feels great in my hands and the grip is perfect. This thing will take a beating if necessary. I'd HIGHLY recommend this knife to anyone looking for a heavy duty blade. I was reluctant to order this kukri because there were no reviews...took a chance and BINGO! Good decision! Will be ordering another! Solid piece of equipment, will be putting it in WTSHTF bag, will be a great defense weapon. Not the first thing I've gotten, but this is awesome. smaller than i expected, but it has a nice weight and a decently sharp edge right out of the box. For the people who say it doesn't stay on your leg, you're supposed to put your belt through it too. Perfect kukri. This thing is awesome, I should have baught two.